Pouring rain? Blizzarding? Your dog will make you walk for 2 miles to find a decent spot to do their business. I kind of wish I was kidding, but this has happened on multiple occasions. Shibas are dramatic and like to keep their area clean, including whatever they believe is part of their home. That means when we have inclement weather; it takes Rigby even longer to do his business, much to my dismay. The escape artist description is not a joke. I touched on this a bit in the last post. However, I do want to warn you that the “escape artist” descriptor you may have heard is very real. We almost had an escape happen accidentally not too long ago, and it honestly scared the you know what out of me. One of Dave’s friends (who happens to not be a pet owner) opened the front door right as Dave was grabbing Rigby’s leash to take him outside. Rigby, thinking this was about to be a fun time, took off out the door and up the stairs, feet from a parking lot and very close to a busy road. Luckily, Rigby is whistle recall trained, so I blew my whistle, and he came running. Always, always, always practice recall training early and often with your dog, regardless of breed. Rigby doesn’t usually go out the front door, but with an unfamiliar guest, he thought it was okay. You just never know! Loyalty, to the point of embarrassment. I’m not sure if it is loyalty or if my dog is just broken, but Rigby gets very alarmed about certain situations. While not unique, the UPS driver, for instance, is cause for sounding the alarm. He also thinks it is very bizarre and uncool if a man walks too close behind me that is not someone we know. No matter how much we have worked on this, he’s relentless. Perhaps he is protective and loyal to me in the way that he knows best, or maybe he is just special. The world will never know. High prey drive: it will strike at the most inopportune times. I’d always heard that some Shibas have a high prey drive, while others do not. I figured out early on that Rigby was one with a high drive and boy can it be annoying. The worst is his obsession with hunting things at my parent’s house. And by hunting things, I mean him trying to dig out the cat toys he’s not supposed to have from under the couch or in drawers. We also had a small rodent incident when he was a puppy that completely freaked my mom out. Yuck. Constant need for stimulation, as puppies and young adults anyway. I never realized how busy you need to keep an intelligent dog like a Shiba in their youth. I can recall working from home, expecting to get work done, and having a cute fluffy puppy barking at me, trying to get me to play every couple of minutes. I learned very quickly that games that challenged the mind were good for tuckering out the little pup. Another thing I never went without were a variety of chews. 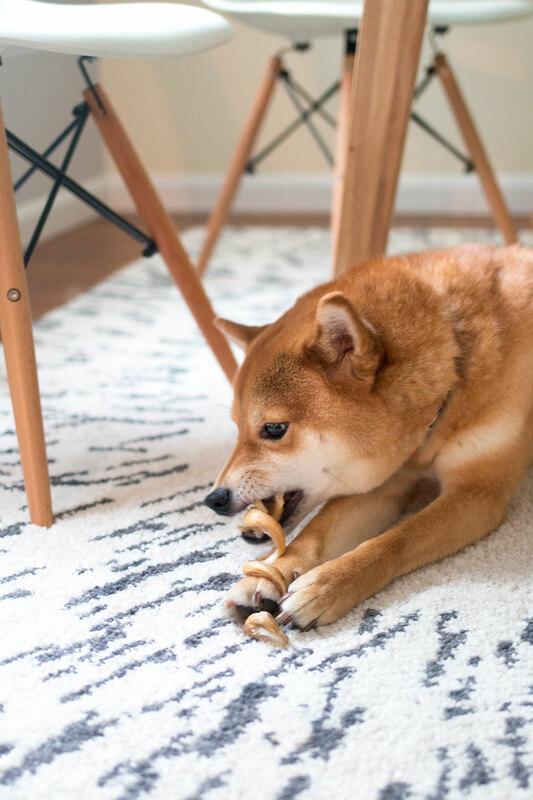 One of my favorite places to purchase safe chews is from Best Bully Sticks, which was the first place I ever bought bully sticks after a fellow Shiba owner recommended them to me. They were kind enough to send Rigby a few types of treats recently to try, and of course, he’s enjoyed them all. My favorite, for him of course, has to be the 6″ odor-free bully sticks and curly bully sticks. These high-quality chews are good for their teeth, high in protein, and best of all, keep the energetic ones occupied for long enough to get at least one thing done around the house. They’ve also got you covered for training treats. I love the ease of tearing these Bison Jerky Strips into small pieces for training and treating, and the pack lasts for a long time for a small to medium-sized dog. If you want to check out Best Bully Sticks, they’ve offered my readers 10% off natural dog treats with code HELLORIGBY through July 31st, 2016. (Not an affiliate code.) If you’re new to Best Bully Sticks, they also offer grab bags where you can try more than one type of treat for your pup at a discounted rate! They’re a huge time and monetary investment. Speaking of buying things, have I mentioned how expensive dog ownership is? It’s not just the purchase or adoption fee you pay, but all of the supplies you’ll need to get right away, the food costs over the lifetime of the dog, any training you do with them, and all of their potential medical costs. The time it takes to raise a dog is also not for the faint of heart. From puppy classes to training to exercising them daily, dogs are basically like toddlers for the first couple of years. That means you may not be able to stay out late, sleep over at a friend’s when you get too tired to drive home, or take an impromptu vacation. Sure you can crate your dog for a couple of hours, but they’ll still need to be fed and let out within a reasonable amount of time. It’s more than worth it, but it’s an important consideration depending on how much support you’ll have and where you’re at in life. Not big on barking, but prepare for plenty of other racket. The good news about Shibas is that they are not a dog that barks and barks all day when you leave them home. Rigby is pretty much silent unless someone knocks on the door. On the other hand, while he may not be a barker, he has a vocabulary all his own. He howls, he yodels, he screams, growls, and cries. Try and clip his nails or touch his feet too much and he sounds like The Exorcist. (I wish I was kidding.) If you follow me on Snapchat (I’m hellorigby, by the way. Yes, shameless plug! ), you’ll also know he gets wound up and does the Shiba 500 fairly regularly which involves all sorts of noise from barks to yips to who knows what. They’re unique, and not for everyone. 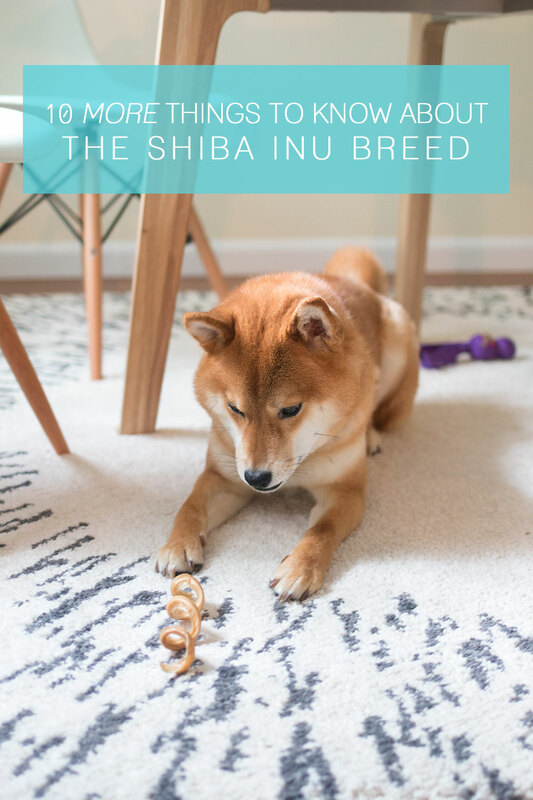 The first question I ask anyone who emails me or asks me about the breed is, “have you met a Shiba yet?” Please, please, please, whatever dog breed you are interested in, go to a meetup and meet the breed! Meeting several will give you a good idea of the overall temperament and personality of that particular breed, as well as how they interact with other dogs and people. 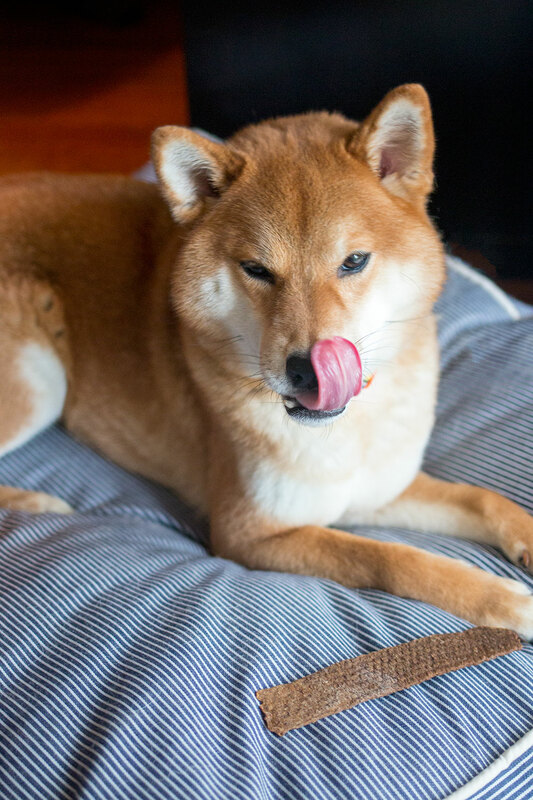 I’d always been fascinated by the Shiba Inu breed, and when I was able to watch them interact with each other and humans at a local Shiba meetup before we ever met Rigby, it cemented the fact that yes, this was the breed I wanted. My best advice to those interested in the Shiba Inu breed is be prepared for the unexpected. You can read 5024937 books and honestly still never be able to know it all. I read and read and read before I ever even met Rigby and I still was absolutely floored by some of his behavior. Not to mention, you’ll think you’re getting the hang of something, or he’s growing out of some weird phase, and next thing you know he’ll throw a new weird behavior curveball at you. Now keep in mind, I don’t write any of these things to scare you, only so that you don’t run out and pick up a puppy without really thinking about it. Dogs are a commitment for life and owning one should not be taken lightly. It’s the best thing I’ve ever done, but it’s also one of the hardest. Rigby is SO stinkin’ adorable. I think it’s awesome that you layout the good, the bad, and the ugly on this breed! I have two dogs, both mixes, and I see so many qualities from others dogs in them. My older girl has a lot of shiba inu traits, but she’s also exhibits husky behaviors and boxer behaviors. Our little guy behaves like a whippet. (We think he’s also mixed with a small herding breed, too.) Dogs are AWESOME and I think it’s says so much when their humans make an effort to understand and communicate with them! You nailed it, yet again. Especially the noises! Gatsby only barks when he’s trying to be protective, but BOY can that dog screech. Haha! Glad you agree with it, Chelsea! 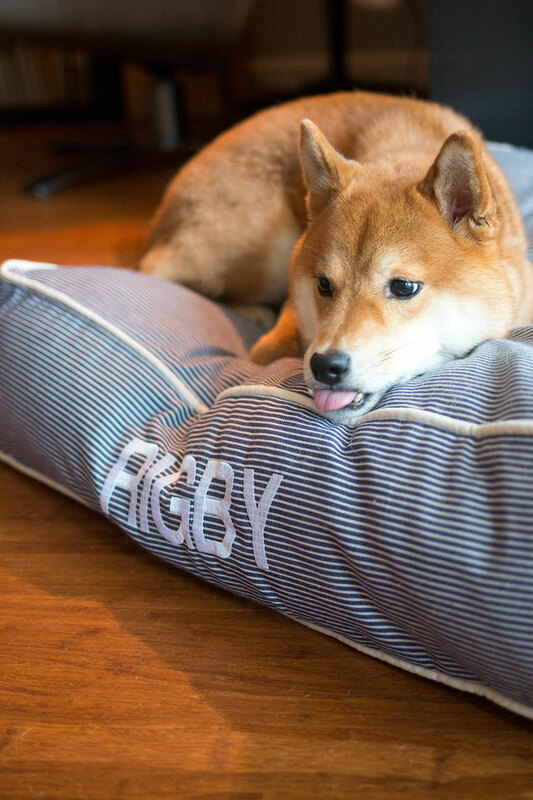 It’s always interesting to hear how different and similar other Shibas are from Rigby! It’s so interesting reading all about Shiba quirks! Rosie is such a unique mix of breeds (golden and GSH) but she has very distinct traits from each breed. She’s very easy going in the house (golden retriever) but will point any small creature/bird and take off after it without a second thought (GSH) She’s also insanely fast, she can keep up with her friend who is a whippet, and she gets that from the GSH of her as well. It’s been fun to discover her different personality quirks over the last couple of years! I love both of these posts (this one and the last one) so much, Jenn! Whenever anyone meets Amaya they immediately want to get a shiba, because obviously she’s adorable and most of the time so sweet to strangers. But I always warn them to do their research! Also, so many of these are spot on… Amaya will never do her business in the afternoon/evening unless I take her on a walk, which is great until it’s freezing or pouring haha. And YES so much to the loyalty to the point of embarrassment. She doesn’t trust old people at all and goes absolutely nuts at them, even my grandparents. So embarrassing. I’m going to have to look into recall training now that you’ve mentioned it… we haven’t done any of that and she is a little escape artist. Rigby is so cute! It’s so important for people to know about the breeds of dogs they get, especially if they have kids or other pets. My pup is an escape artist too! Whistle training sounds really helpful! How old was Rigby when you tried it? Aw thanks Rachel! Whistle training is amazing. He still remembers it at 3 even though we haven’t practiced it in a long time. We started playing the “recall game” where he would go from person to person to get a cookie inside the house when he was about 4 months old. We added whistle training in at about 6 months or so after a second trainer recommended having an additional emergency system! So cute! There’s a Shiba that just moved into my building. She’s the black/tan fur though. Did I tell you how Starla escaped her leash a little while ago? I had a new harness for her and the way that it pulls, it hit the latch on her leash and unbuckled her. I panicked (bad move) and went to grab her and she thought I was just playing and ran across the street thinking I wanted to chase her. So bad. She knows recall but I just lost my mind and kept chasing her. So scary. She was fine and thought we had a great time. But now I know what to do in another situation like that. No! How scary! Of course she would think that, oh my goodness. That would have freaked me out too and so glad you both were okay! And yay for a new Shiba neighbor. Does she get along with Starla? My husband and I own a Shiba, same color as Rigby. Her name is Yoshi (named after Yoshi from Mario Bros. as we are big video gamers). We love her to death. If I had to give advice to another possible pet parent to be, I would say Shiba’s shouldn’t be your fist dog to own. Shiba’s have there own unique personality, as puppies they will bite everything they can unless you put the time and effort in training them not to, as you have mentioned escape artist is no joke about his breed, and also female Shiba’s are more attached to male person and male Shiba’s to female person. We are considering getting a second one (boy, name in in debate perhaps Dante..) because we see that our Shiba loves being around dogs, loved to be chased but not be the chasee. They like companionship only when they seek it. They gain weight very easily if not properly exercised. Speaking out of experience because Yoshi had to have a FOB surgery on her hip. During the first 3 months was a painful time for her therapy walks. Although she loves going on walks and run outside, inside she doesn’t have the same energy anymore since her surgery and gained weight during those months of rehab. Handy. No screaming. A little crying, but no screams.